I’m proud to say we’re heading directly toward the home stretch for this first chapter of Long John. With only about three weeks left, I figured I’d give an update as to how things are going to be working once “Sunza” is completed. My goal once this first chapter is done is two-fold. First and foremost, I’m going to try to hit the pavement pretty hard in terms of getting the word out there for people to come check the comic out, mostly because now there’s a complete story to read, even if it is simply a small piece of a larger one. I’ve planned “Sunza” to mostly stand on its own as a fun and interesting (to me, at least) western short story so that, in the interim between chapters 1 and 2, enough intrigue could be developed to get people to come back, but also (and most importantly) that when people come to the site they read the story and simply have fun with it and tell others about it. That’d be great. So, if you want, start spreading the word about Long John if you like it (even more so if you love it) and let people know that this first story is about to end and now is a perfect time to catch up and still be in on the ground floor. Secondly, even though Long John is planned as a complete story, once “Sunza” is done, I’d like to compile it into a cheap print version so I can start hitting up the convention circuit again and have something to sell. I’m not quite sure how this is going to work, but I’ll let you all know here first (and/or on the Facebook page) about any developments in that arena. I’d like the print version of this chapter to be special, so if you have any suggestions for extra content for the book, I’ll be all ears (short of writing and drawing up more pages, of course…that’s a bit much to demand) because I want to give fans what they want as well as give potential new readers something that’ll really bring them into the fold. The pages are coming along beautifully from Josh. I’m really excited for you to see them. I’ll admit that I’m really excited to hear your response––both good and bad, to be honest––because his style is so incredibly different than mine, with a sense of visual storytelling that is much more painterly than that of a graphic novelist. Even if it bothers and unsettles you, I hope you one day come around and see that there was really no one who could do those pages better than Josh. 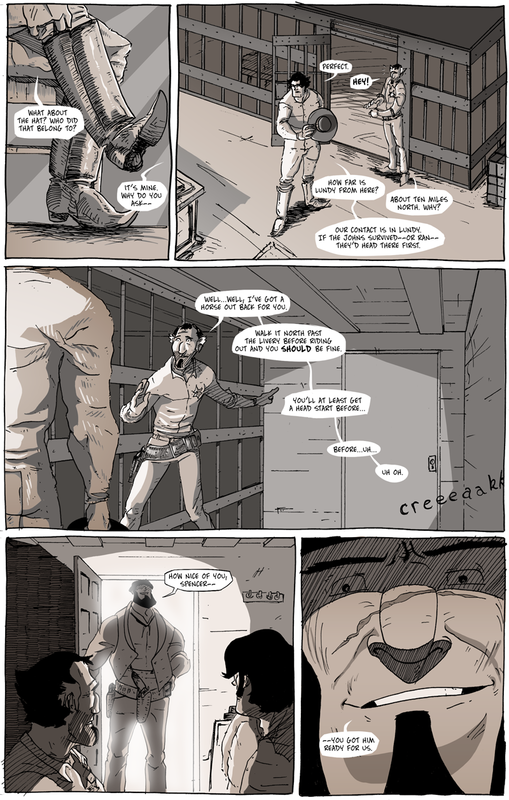 After the conclusion of “Sunza,” I’m planning for about a week break before Josh’s pages start going up on the site. If anything, it’s to get that initial wave of press out and for people to come to the site and see the comic and to give them time to get caught up before new content––Josh’s content––starts updating. It’s a rhetorical choice, surely, but I feel it’s for the best. With my current schedule teaching full time, I need to focus all my attention on my students. Luckily, there is some downtime during the term which will be spent 1) working on some non-Long John projects that I’m itching to get back to, 2) finalizing and beginning to draw chapter 2 of Long John, and 3) continuing to record and edit my podcast, For All Intents and Purposes. At the latest, I’m going to start drawing chapter 2 at the start of Winter Break, which means new pages will go up sometime in January 2015. That sounds like a long time away, but by the time Chapter 1 ends and by the time the Hellrider Jackie story is over it’ll only be something like a month or two. Needless to say, I’ll make a big stink once Long John starts updating again, so be sure to subscribe to the RSS feed or join the Facebook group to keep up to date with the latest developments. Though I won’t get into it––and will be more concrete about it as chapter 2 approaches––expect also a change to how the comic will update with the next chapter, for it will surely be different from how it is currently updated. I’ve added to the “Links” portion of the website all of the press Long John has gotten so far. It’s not much but will surely grow as the comic goes forward. Be sure to check it out and leave comments on the pages of those people/organizations that have been gracious enough to ask for interviews!